I do believe I have a new favorite Shakespearean play. I’m sorry, my beloved Hamlet, but Macbeth stole my soul and kidnapped my sleep. It kept me awake at night simply marveling over the profound themes of guilt, murder, death, and prophecy. Macbeth, my friends, is one of the most incredible plays I have ever read. My Shakespeare love has officially exploded, and right now I’m in the middle of a Shakespeare class! Reading plays, analyzing them, writing about them??? Can life get any better? The truth is, I had not read Macbeth until starting the class, and Macbeth was the first play we had to read (and write about). So yes, hither I come to share with you yet another “spotlight” post. I hope this one is as dazzling as my last few and does not bore some of you. Trust me, Macbeth is anything but. I usually focus on a one to three aspects of a literary work whenever I do spotlight posts, and I plan to do the same for this one. Here, I want to look at the character of Lady Macbeth. The weird sisters were such intriguing characters to me. They talk in unison half the time, they move in sync, they are insanely creepy, and they are interestingly mysterious. Shakespeare’s idea of what witches are is rather comical, but it’s so very sinister at the same time. I just loved it so much. Anyways, I also want to discuss the scene in which Lady Macbeth and Macbeth come together for the first time after the murder of King Duncan. It is so full of symbolism; the voices they hear, the fear they feel, and the words they say. Okay, so let us begin! 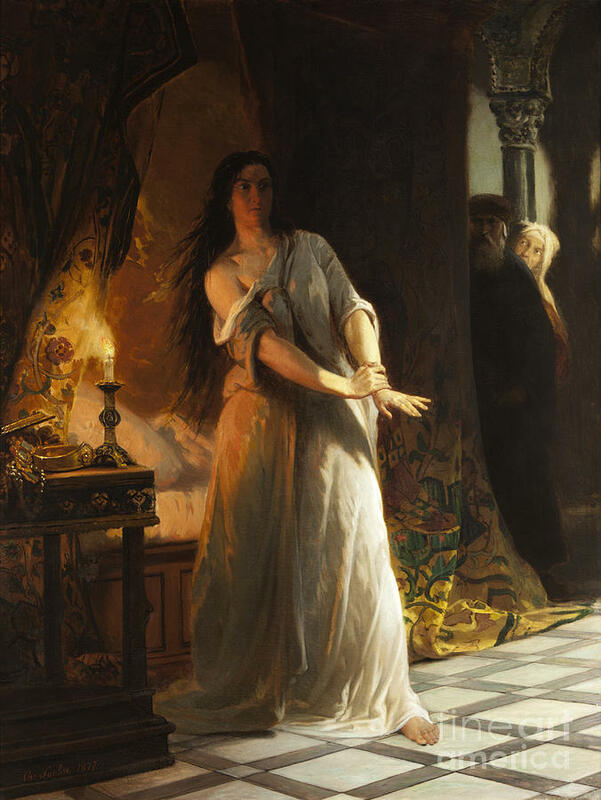 Lady Macbeth is one of my favorite female Shakespearean characters. In a nutshell, Lady Macbeth is ambitious, driven, and undeterred. What makes her such a dangerous character is her reaction to the predictions of the weird sisters. When she learns that the witches have correctly predicted that her husband will be Thane of Cawdor…and then, in the future, he will be king, she is determined to see the final result fulfilled. Lady Macbeth is given the news in a letter from her husband, and she reads it alone in her chamber. Her reaction, however, is a chilling one. What thou art promised. Yet I do fear they nature. She scolds him in her mind and pointedly asks: “You know you’re supposed to be king, but you are not willing to kill Duncan to seize the crown?” She sees her husband as a weakling, who she will make strong. So, she wants him to hurry home fast, so she can “pour my spirits” into his ears. So she can intoxicate him with her ambitions and turn him onto her side. If he cannot be ambitious on his own, then she will make him ambitious. She knows the power she possesses over her husband. It appears to the audience that Macbeth must be in awe of his powerful wife, that he is infatuated with her, and that he respects her to the highest degree. And Macbeth murders the king, because of his wife’s persistence. Lady Macbeth is ruthless throughout the duration of the play. What I find so fascinating is that her resolution to turn Macbeth into an inexorable pursuer-of-ambitions like herself comes to fruition. Her prophesy was fulfilled. However, she begins to turn into a guilt-laden woman, fearing the stains of metaphorical blood, driving herself mad to remove them, and ultimately kills herself because the grief is so overwhelming. As her husband becomes more and more ruthless, she becomes more and more guilt-ridden and burdened…even to death. Of all the fates I had imagined in my mind for Lady Macbeth, none of them was the fate of suicide. It is clear, towards the end of her life, that she is obsessed with guilt. Guilt over, it seems, the transformation she stirred up in her husband…not the death of Duncan. If there is an icon for the “powerful female” character trope, it is Lady Macbeth. She reminds us that women have power, women have the capability to manipulate, and that women have the capacity of using (our) femininity for good or ill.
No, I don’t care that that’s cliché. Still, Lady Macbeth is such a complex, interesting character that I think she is one of my new favorites. 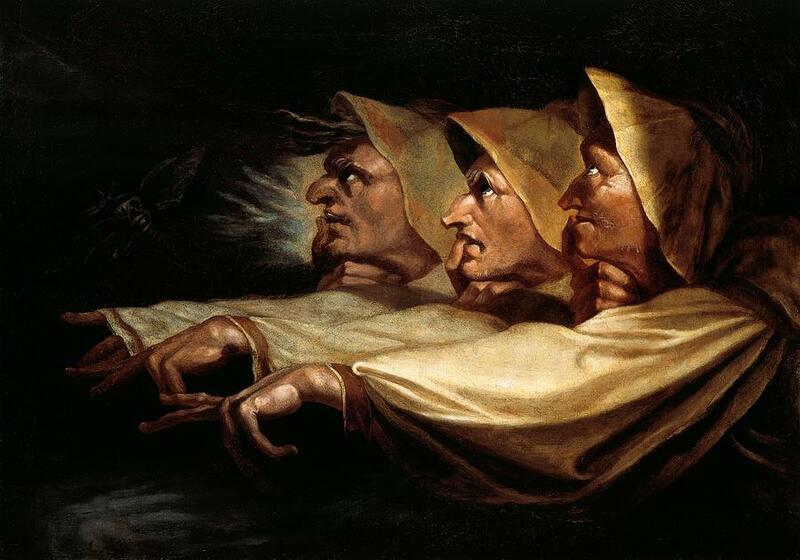 The weird sisters are the other major female power in Macbeth. It’s interesting to note how the central characters who really drive the beginnings of the plot in Macbeth are female characters. I think Shakespeare was something of a feminist, if I’m being honest. Especially in this play, we can see that the female characters really drive the action in the first half. They have a dominating presence, and that presence is clearly visible when the weird sisters first meet Macbeth and Banquo. The men are terrified of them, but there they stand: bold, frightening, and powerful. The weird sisters are of a synonymous spirit, mind, and agenda. They talk in unison on numerous occasions, they move in unison, and they never disagree with each other. They are such a chilling trio. The impact they leave on the audience is remarkable, and their iconic “something wicked this way comes” is just so creepy. And that’s why it’s so good. The odd, devilish mystique of the weird sisters is what makes them such interesting characters. Shakespeare’s ideas of witchcraft are a bit comical, but it is still enough to give the audience the idea that these women are evil. There is no good in them. I want to watch this full length version of this Macbeth so very badly. I am a pretty big Christopher Eccleston fan…the ninth doctor is awesome. Sorry. 🙂 I still need to finish season one, but I just…yes. Back to the weird sisters. The synchronous nature of the weird sisters is what made me so fascinated with them. There is no harmony whatsoever in the lives of the other characters of the play, but the troublemakers are completely peaceful, united, and complete. The weird sisters all have one goal in mind: wickedness. Honestly, this is the one time where characters who are evil for the sake of being evil actually works. Witches who just want to make trouble in a Shakespearean drama makes sense. We don’t question it, because it really is so compelling. But their unity is what makes them so distinct. They are the ones with the clarity, the vision, the truth, if you will. If there’s one thing I can take away from the weird sisters, it’s that in all things, accomplishment comes from unity. This scene is my favorite in the entire play. Macbeth feels the weight of his guilt, and he is haunted by the fact that he cannot say “Amen” when the king’s grooms prayed “God bless us.” Why could he not say amen? He needed a blessing most, but why couldn’t he bring himself to say amen? He hears the voices of his guilt: “Macbeth does murder sleep.” “Macbeth shall sleep no more.” It honestly just speaks for itself. In conclusion of this post, watch this moment in the play. Just watch and really let it sink in. Shakespeare is about the words, but it’s also about the acting. Just watch how compelling Eccleston and Cusack’s performances are. The agony of Macbeth, the dismissals of Lady Macbeth, and the terror in their hearts as they think they hear voices…and they do…the voices of their consciences. Wow. Isn’t that an amazing play? I have not even begun to scratch the surface of the interweaving complexities and plot twists of Macbeth! I would encourage you, dear readers, if you have not already, to go and read Macbeth in full! It took me on such an amazing narration, and it is officially my favorite Shakespearean play. Oh, and what did you think of my little Macbeth post? Would you care to add anything? Have you ever seen the drama performed, either on stage or on television? Please comment below! I always love getting comments; they make my day. I will release the tag in a few days; I really hope we can get a ball rolling. Follow The Altogether Unexpected via email! Hullo! I'm just your out-of-the-box seventeen-year-old uni student obsessed with the goodness of Jesus, tea, literature, Shakespeare, and all things from the jolly old UK. Hope you enjoy some of my philosophical ponderings about books, tea, and theodicy. Cheerio!